Incontinence is a widespread condition that ranges in severity from ‘just a small leak’ to complete loss of bladder or bowel control. In fact, over 3.8 million Australians have bladder or bowel control problems for a variety of reasons. Incontinence can be treated and managed. In many cases it can also be cured. For more information please visit the Continence Foundation of Australia www.continence.org.au OR call the National Continence Helpline 1800 33 00 66 The National Continence Helpline is a free and confidential service managed by the Continence Foundation of Australia for the Australian Government. 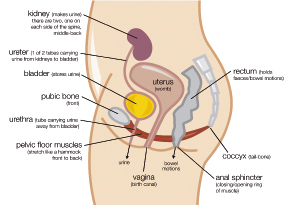 Overflow Incontinence Involuntary loss of urine when people are unable to empty their bladder, which in turn causes over-distension and dribbling.